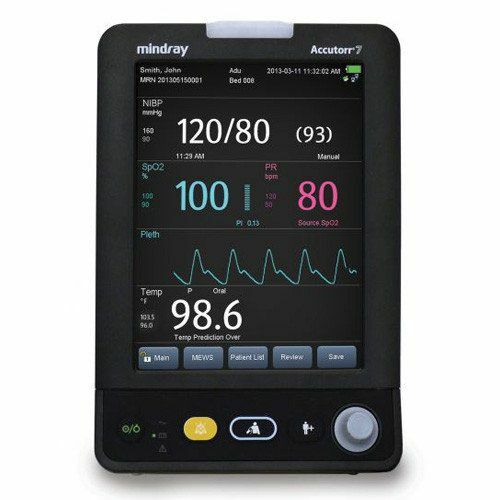 The Mindray Accutorr 7 Patient Monitor is an easy-to-use vital signs monitor that is ready to go when you are in any low acuity setting. From spot check to continuous monitoring, assess patients’ vitals with NIBP, SpO2, and temperature measurements. 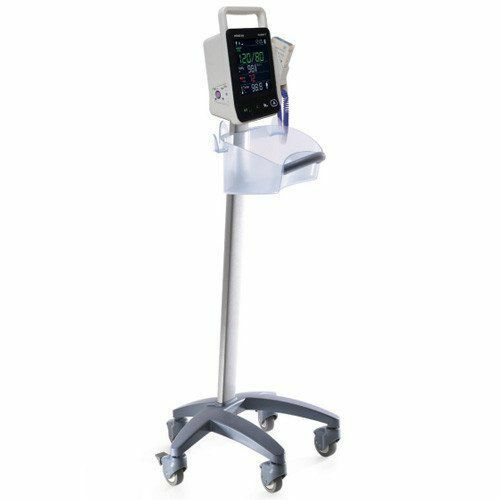 With the addition of low flow sidestream CO2 and central monitoring connectivity, identify signs of patient deterioration due to respiratory distress. Its integrated early warning scoring system aids in clinical decisions. 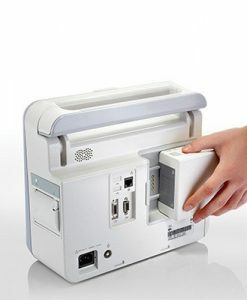 With its flexibility, the Accutorr 7 is a vital solution for delivering quality care. And the Accutorr 7 offers flexible connectivity options meeting your institutional requirements. With wireless capabilities using shared infrastructure, mobility between patients and real time data posting at point-of-care to your EMR can improve efficiency and reduce manual errors. 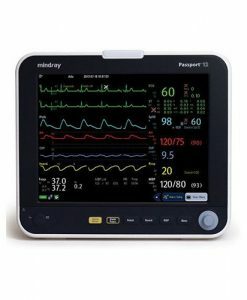 Its large 8.4″ back-lit high resolution TFT display provides a clear view, and its intuitive touchscreen offers easy access to information. Other features include: available SpO2 technology includes Masimo SET® (standard) or Nellcor Oximax®; PI (Perfusion Index) from SpO2 can guide caregivers to best measurement location; manual, automatic and customizable NIBP measurement modes offer flexibility for various clinical applications; manual input of vitals such as respiration rate, pain level, glucose, fluids, and degree of consciousness; optional Mindray SmarTemp® or Welch Allyn® SureTemp® Plus temperature; low flow sidestream CO2 provides measurements of FiCO2, etCO2, awRR with a CO2 waveform; stores up to 5,000 measurements, accessible by patient ID for easy review; optional barcode scanner can speed patient ID input; choice of hardwired or wireless EMR connectivity options; integration with ADT and results messaging easily accomplished via Mindray’s powerful eGateway; direct HL7 interface capabilities; clinician authentication through Mindray MLDAP Server connecting with the hospital Active Directory (AD); centrally monitor patients on the Accutorr 7 with the Mindray BeneVision Central Station; supports nurse call interface; standard RS-232 interface for third party connectivity solutions. 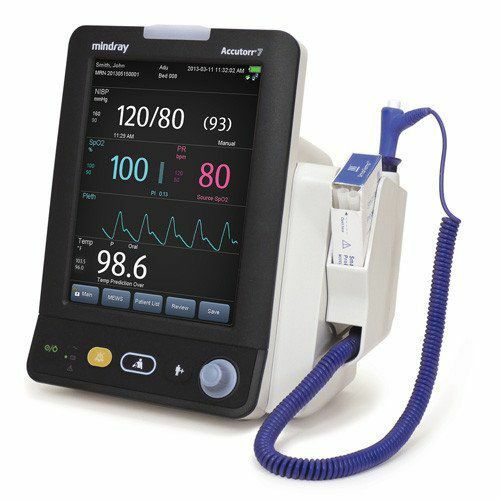 Accessories included in system purchase: one adult cuff, NIBP hose, line cord, operator’s manual, SPO2 cable and adult finger sensor (monitors including Masimo or Nellcor) and oral/axillary temperature probe, and 2 boxes of probe covers (monitors including SmarTemp only). All other accessories (including battery) must be ordered separately. 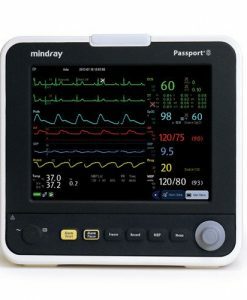 National Ultrasound is the North American Distributor for Mindray and our experts are standing by to answer your questions about the Mindray Accutorr 7 Patient Monitor. Take a few seconds to complete the quick quote form below. 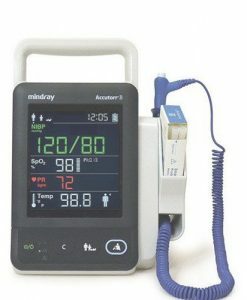 The Accutorr 7 patient monitor measures NIBP, SpO2 and temperature. 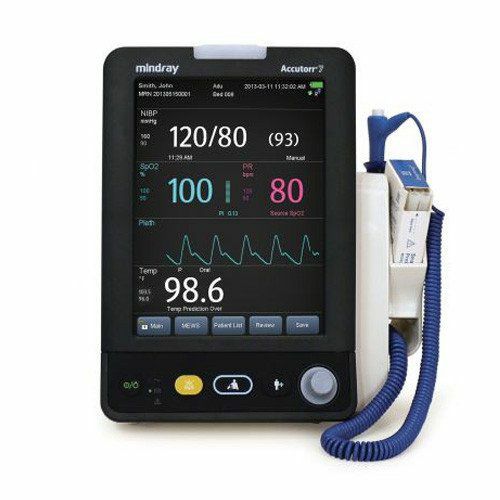 It has the capability for manual entries of up to six additional vitals and customizable NIBP modes.